Jose Altuve is the 2017 American League Most Valuable Player, and to honor this achievement Big Time Bats is pleased to released a LIMITED commemorative bat featuring Altuve's authenticated autograph. 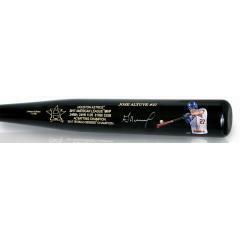 Big Time Bats has obtained a limited number of Jose Altuve MVP art bats signed by the Astros' infielder, All Star, League MVP and World Series leader. Through the application of exclusive technology, each bat features an action shot of reproduce artwork by the very skilled and renowned sports artist Jolene Jessie. These bats include a special engraving with Altuve's 2017 season statistics and accomplishments. Your bat includes signature authentication by Beckett Authentic. Altuve received 27 of 30 first place votes to win his first MVP award, joining Jeff Bagwell as the only Astros to win a league MVP Award. Altuve was the AL batting champion with a .346 average, while collecting 204 hits. The 4x Silver Slugger award winner had 24 home runs, 39 doubles, 112 runs scored, 81 RBI, and 32 stolen bases. What a year it was for the 2017 AL MVP and World Series Champion. These bats will not last long, so get yours before they sell out!